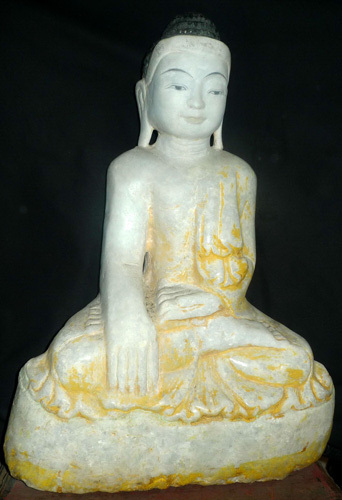 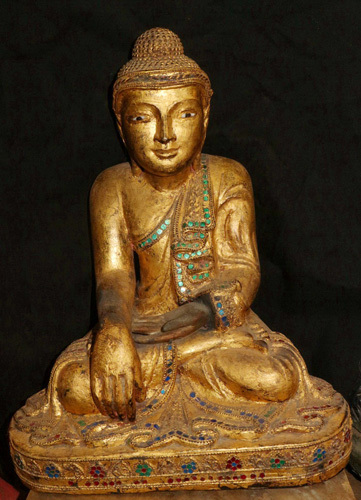 A youthful, sweet-faced image of the Buddha wearing a robe elaborately folded, edged and decorated, often with inset mirror glass, has attained great popularity and has become known as the 'Mandalay Buddha'. 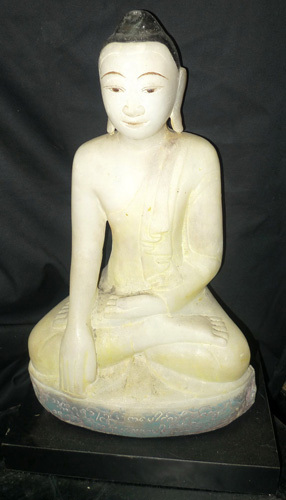 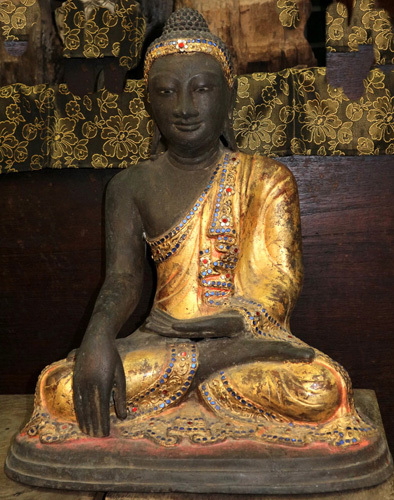 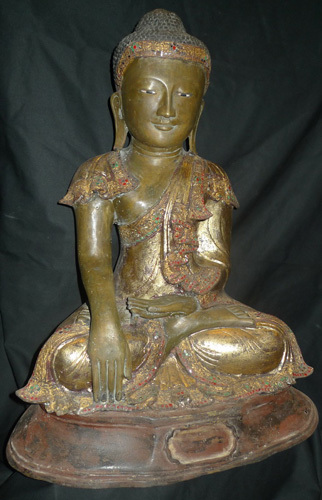 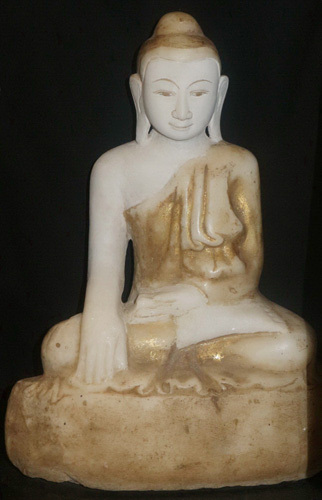 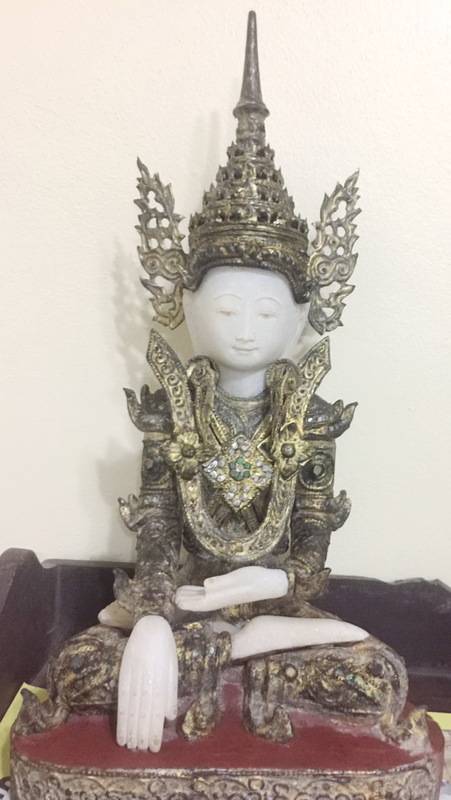 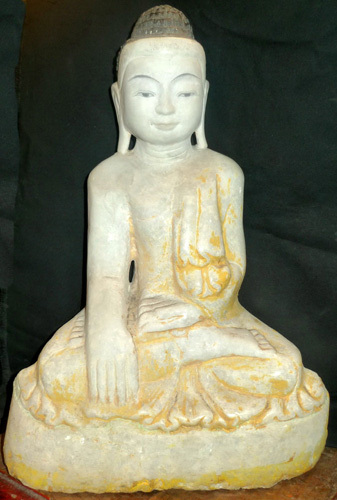 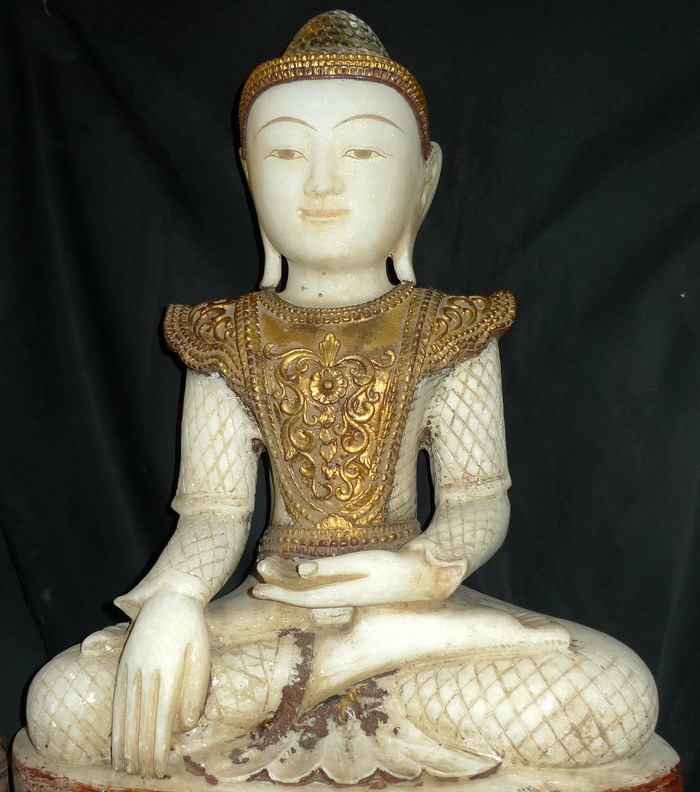 For many people, it came to epitomize the Burmese representation of the Buddha. 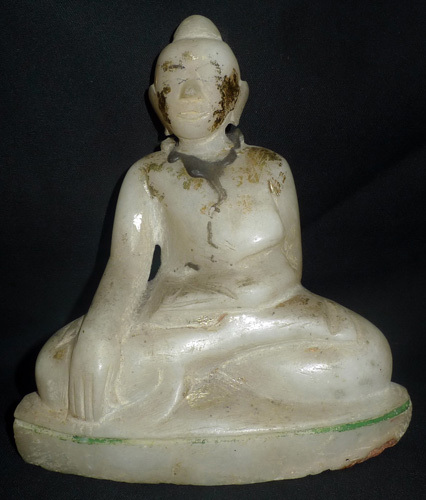 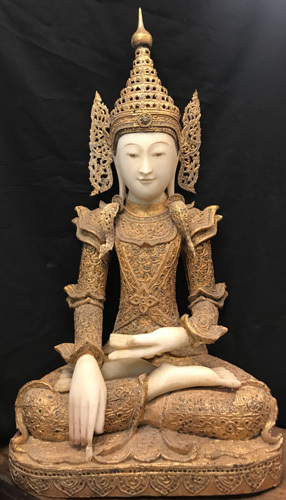 Late 18th century-- early 19th century Buddha images in Central Myanmar had in many cases shed their onion-type lotus finial for one shaped like a pointed lotus bud. 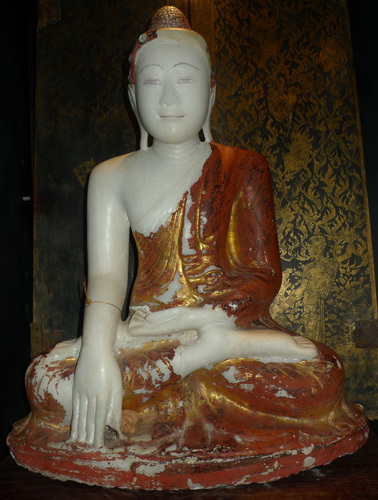 This is the case for example, in the great alabaster Buddha image of the Kyauktawgyi pagoda, Amarapura, created by King Pagan Min in 1847. 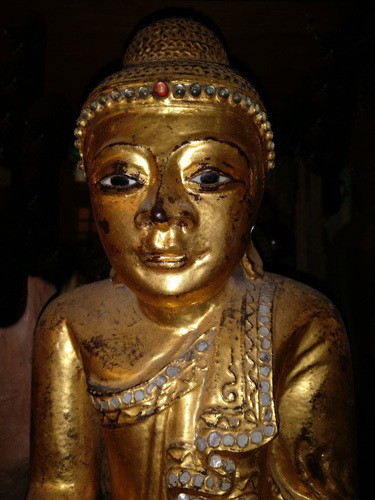 Yet in 1855, Linnaeus Tripe photographed in Amarapura a huge Buddha image of unprecedented Ava-Amarapura style. 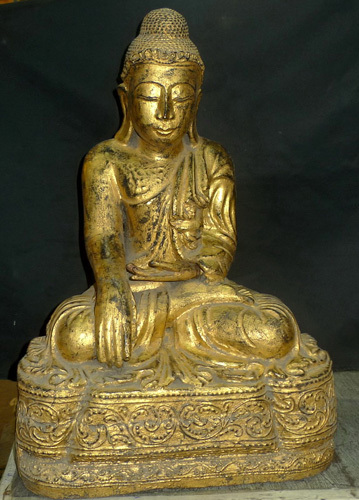 It had a broad ushnisha, no lotus finial and a more elaborate draping of the uttarasanga (outer robe) than usual. 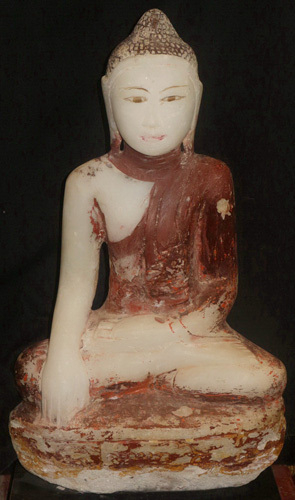 This may be based on the design of Rakhine Buddha images. 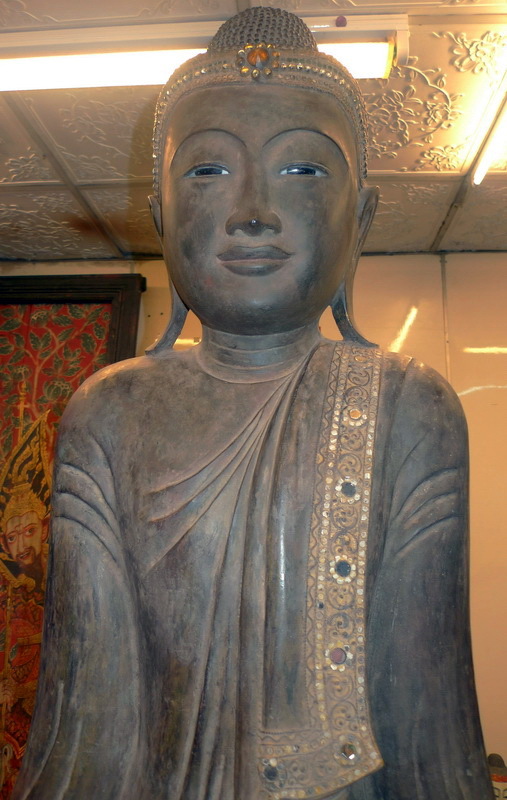 Mandalay images often have a broad band across the forehead. 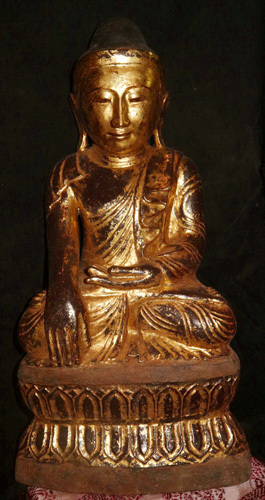 The hair hugs the head in tight curls and covers a broad prominent ushinsha. 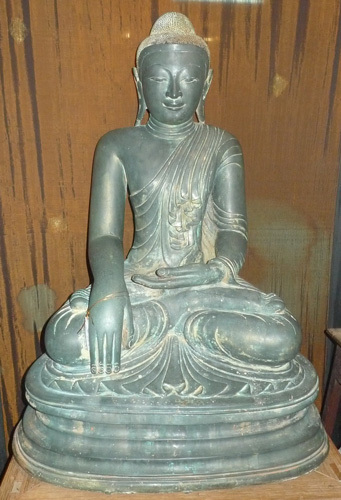 There is no lotus finial above. 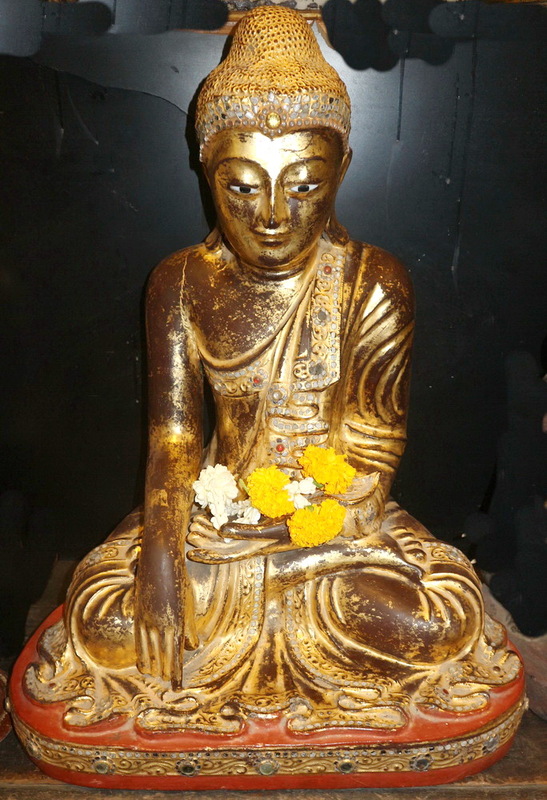 The images are frequently seated in vajrasana with the right hand in the bhumisparsa mudra and the left lying in the lap. 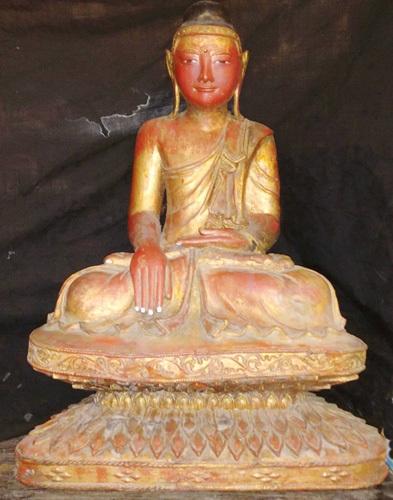 The uttarasanga is worn in the open mode and the sanghati is folded decoratively on the left shoulder. 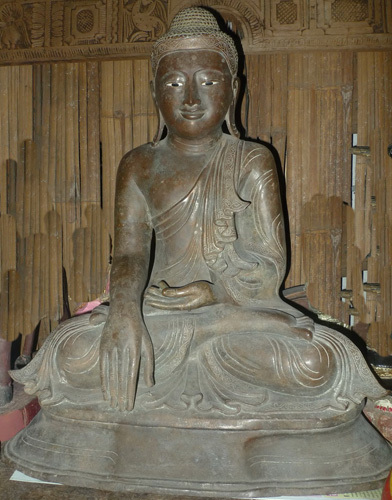 Wood, alabaster and bronze have been the favoured materials. 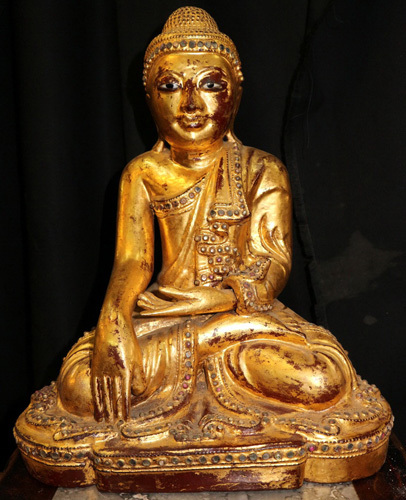 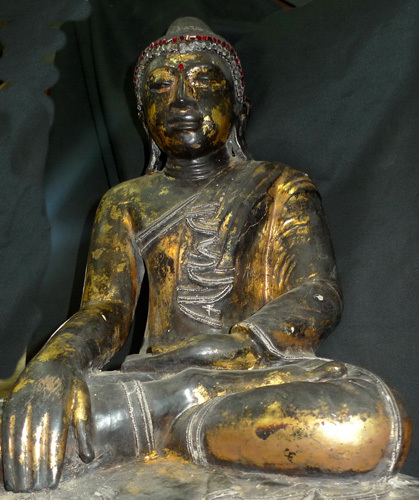 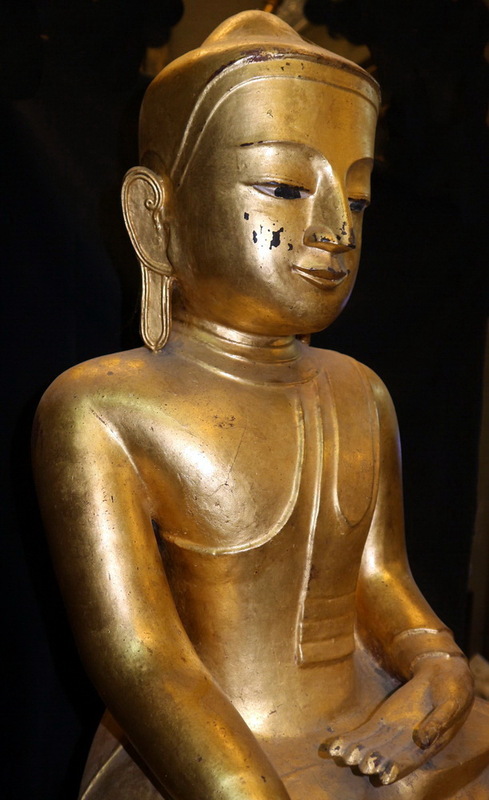 Many Buddha images are lacquered and gilded, including the face and body, the latter in accordance with the suttas (discourses of the Buddha) which relate that his complexion was like bronze, the colour of gold. 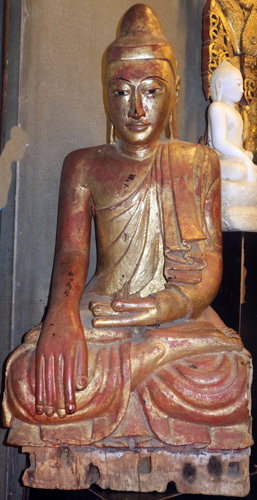 Most standing Buddha images wear the uttarasanga in the closed mode, covering the arms and chest and held at each side of the lower body by downward stretched hands. 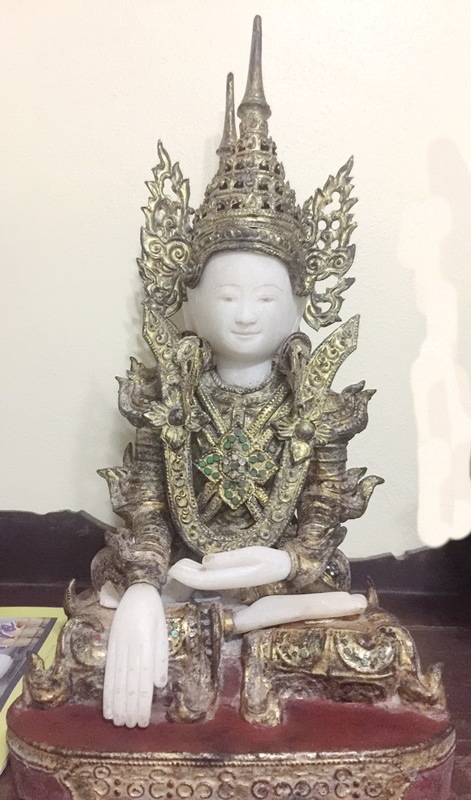 Below, at its lower centre, appears the antaravasaka. 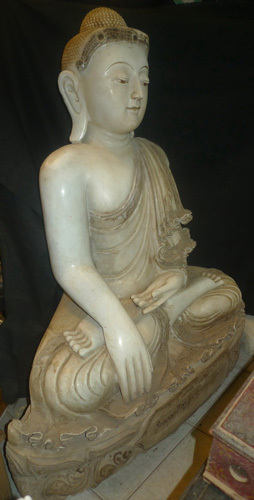 The sanghati flows in multitudinous folds from the left shoulder. 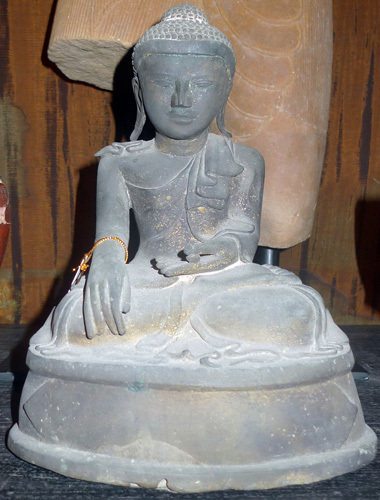 In this right hand the Buddha holds the medicinal myrobalan fruit. 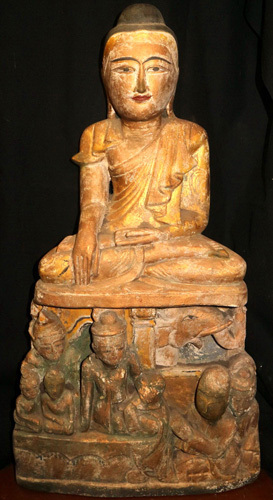 This suggests that the image is Bhaisajyaguru, a form of the Buddha of Healing, one of whose attributes is the myrobalan.